What do we know about next-generation NMC 811 cathode? Nickel-manganese-cobalt (NMC, NCM) cathode is pushing its boundaries again. And much has been speculated ever since the SK Innovation and LG Chem statements sparked a new round of anticipations in summer 2017. NMC 811 is meant to be the next-generation cathode – ‘better and cheaper’, pushing electric vehicles beyond a 500 km (~300 mi) driving range and soon to price parity with the internal combustion engine. 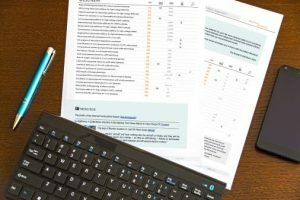 What is NMC 811, really? NMC 811 is a cathode composition with 80% nickel, 10% manganese, and 10% cobalt. It’s basically an improvement of what’s on the market already, rather than a distinct, novel chemistry. NMC (Ni-Mn-Co) cathodes with different Ni-Mn-Co compositions have been around for almost 20 years now, with many of the key publications and patents emerging already in the mid-2000s(1). Following the initial commercial success of NMC 111 (⅓ Ni, ⅓ Mn, ⅓ Co – also abbreviated as NMC 333), NMC cathodes have become mainstream, being used in the BMW i3, Chevy Bolt, or new Nissan Leaf (on the grid side, it’s the Tesla Powerwall). Industry has been improving NMC technology by steadily increasing the nickel content in each cathode generation (e.g. NMC 433, NMC 532, or the most recent NMC 622). The cells have higher capacity and lower weight, which means the battery packs store more energy and have better driving range. In fact, you don’t need to search too long to find a Ni-rich chemistry similar to NMC 811 – it is NCA, made famous by Panasonic and Tesla. NCA cathodes typically have 80% Ni and 15% Co, but are ‘doped’ with aluminium as opposed to manganese (note, this is only where the similarities start). 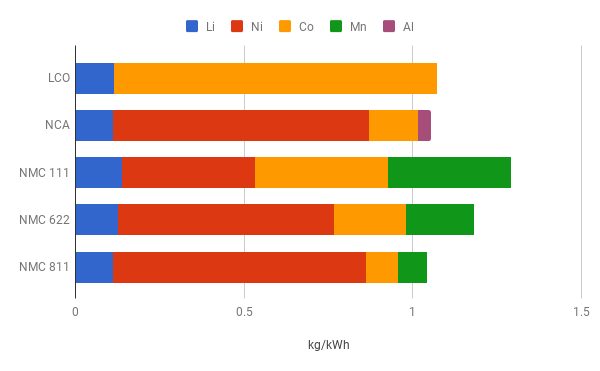 Comparison of different battery chemistries – LCO, NCA, and NMC – and their material/elemental composition (data plotted from Fu et al.(2)). It’s worth noting the importance of Ni because it’s largely responsible for the cathode capacity, with Mn and Co helping (in a broad sense) with chemical and structural stability(3). As a matter of fact, increasing Ni content is the most effective way to enhance capacity in the current state-of-the-art batteries without going to uncharted territories of new battery chemistries. It’s quite good. 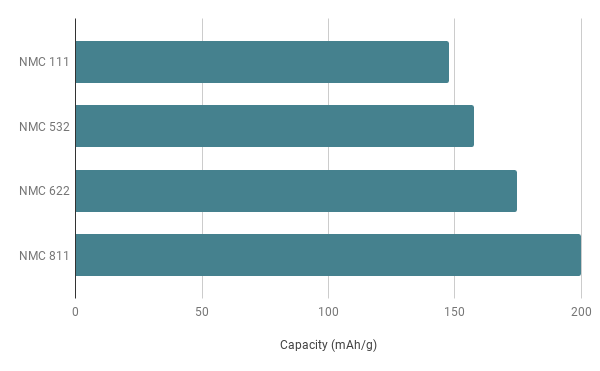 High Ni content is important to improve capacity, so a 20% increase from NMC 622 (or almost 50% from NMC 111) pushes the capacity of NMC 811 to around 200 mAh/g (with an average discharge potential of ∼3.8 V)(3). 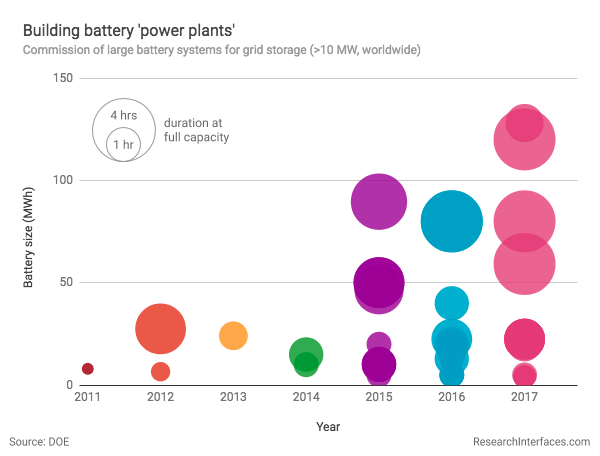 Not a giant leap, but much better than the current generation NMC cathodes, and many say it will dominate the battery industry. Comparison of NMC cathode compositions and their capacities (disclaimer – this is only approximate comparison as each value represents an average capacity across multiple academic studies, however, with similar cutoff voltages and discharge rates(4); the exact values might naturally differ from other academic or commercial values). It will likely be cheaper than its competitors, though this will take some time. The main, straightforward argument for NMC 811 is that it needs less cobalt – only 10%, down from 20% in NMC 622 (or ~33% in NMC 111). And that means big savings because Co is a very expensive component with a very questionable supply chain. Note, cathode materials account for about ¼ of the cell cost(5). While Ni and Mn prices are relatively low and steady, the cost of Co skyrocketed by more than 200%, climbing from ~$35,000/ton to >$75,000, in 2017 alone. Now, the other side of the equation – NMC 811 is a significantly more sensitive chemistry than NMC 111 (or even NMC 622), so its production will require not only improved synthetic processes, but likely also additional post-processing steps(6). All this will inevitably increase the manufacturing costs. The reason? High nickel content. NMC is synthesized with Ni in oxidised state Ni3+, and it’s difficult to achieve this for such a large Ni percentage (80%). The whole process is very sensitive, largely due to instability of Ni3+ at the high synthetic temperatures(1,7). Therefore, even a minor deviation from the process parameters has a strong impact on the final cathode structure… and performance. Moreover, synthesis of Ni-rich NMC comes along with undesirable residues (mainly Li-based) that need to be removed or passivated via additional steps. As with the synthesis, the post-processing conditions require precise control. And don’t forget – NMC 811 is also sensitive to moisture and air(6), which makes its handling and storage quite a challenge(8). Producing, storing, and integrating NMC 811 in tons will be more difficult than with its predecessors. 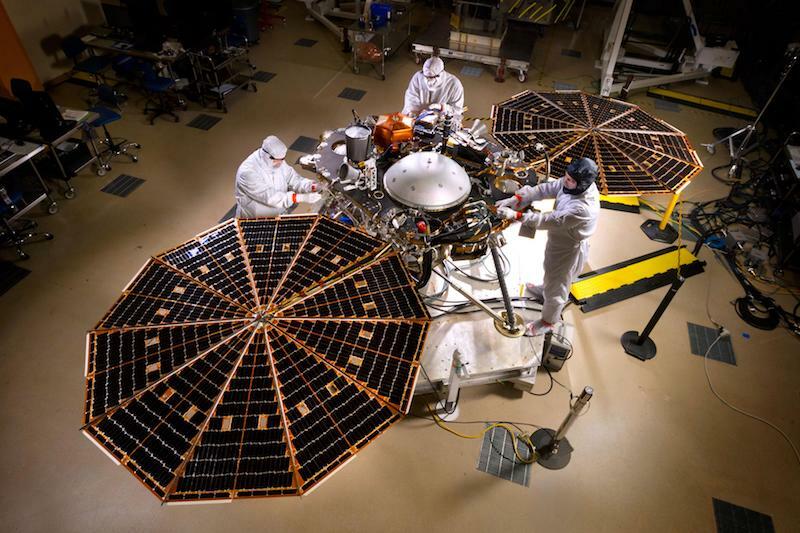 Still, manufacturers will learn, fine-tune, scale the processes, and it will start paying off. And not only due to the lower Co content in NMC 811, but also thanks to its higher capacity and energy density, the final $/kWh will be all the more appealing. This is another tricky bit. Inherently, NMC 811 is not very stable. Again, it’s nickel. There is, for example, a chemistry issue: fully oxidised Ni4+ (what you should get after charging) is reactive and so its excessive amount increases unwanted side reactions with the electrolyte(7,9). There is a materials issue: Mn and Co do a good job in holding the NMC layered oxide structure together, so expectably their content reduction leads to a decreased structural stability of the material(3,6). Finally, there is an engineering issue: NMC can be charged to higher capacity the higher you set the cutoff voltage, however, residual lithium compounds (among other things) make this risky as they decompose at high voltages to produce dangerous gases and swelling of the cell(10,11). Not to make it sound more problematic, but elevated temperatures make everything – from chemical to structural instability – worse, increasing the degradation, cell swelling, and chances of thermal runaway. Ni-rich NMC cathodes are sensitive to elevated temperatures – release more O2 than their counterparts (left picture) and also undergo more structural changes (right picture)(12) (posted with permission from Nam et al., copyright 2014 American Chemical Society). Is it safe? And how will it get better? If people are comfortable driving with a 500 kg pack of NCA cells under their seats, they will be fine with NCM 811 as well. And much will be done to ensure the safety doesn’t become an issue. Researchers are already investigating multiple strategies to address its stability(1,3,6), such as ‘doping’ with other elements/materials to improve chemical and structural stability, coating the cathode surface to ‘passivate’ its reactivity, using stabilizing additives in the electrolyte, or strengthening the separator safety. An elegant approach is to synthesize the NMC particles (particles are a common form in which cathode materials are synthesized), where the inner part is Ni-rich NMC 811 and the outer part a more stable Mn-rich NMC(13,14). This ensures that the cell capacity is largely retained while the cathode surface (where most problems originate) remains stable. Optimization usually goes in incremental steps, and such research takes time and a lot of rigorous testing. One thing is certain, though: each chemistry is complex and unique, and so the recipes developed from the previous NMC generations will not likely work for NMC 811. Great, when is is coming? LG Chem and SK Innovation claim NMC 811 will be in mass production by the end of this year and integrated into EVs soon thereafter. But these statements are also a typical showcase of corporate ambitions and battling for publicity. Challenges with manufacturing, stability, and safety of NMC 811 suggest the timescales might be more conservative. Actually, many experts and analysts don’t believe the technology will see wider adoption before 2025 (see also Fu et al.(2)). Will there be any competition? The most obvious competition is NCA used by Panasonic and Tesla. It’s very similar to NMC 811, whether you consider its Ni-rich chemistry, superior capacity, more complicated manufacturing, or stability issues(1,15). Note, NCA technology is developing as well – increasing Ni content over 80% will improve cell capacity, and already established experience with NCA development will steadily improve cycle life. It’s even plausible that the benefits of both chemistries will be combined. Finally, there is a natural NMC progression – a cathode with >80% Ni content. Many researchers have already looked into these materials, but they might only be applied in the more distant future. Follow us on Twitter, or just shoot us an email with any feedback or suggestions. We’ll be happy to hear from you! Are you a battery researcher? Our subscribers get regular updates on interesting battery news and research literature. Cookies help us deliver and improve our services, learn more.